Nick Foles completed 28 of 43 passes for 373 yards, three touchdowns and one interception. He also caught a 1-yard touchdown pass from his tight end on a trick play that underscored Eagles Coach Doug Pederson’s willingness to gamble all night long. Give a lot of credit to Foles for the Eagles first Super Bowl win. He was not only good with a clean pocket (97.5 passer rating) he was also solid under pressure (95 passer rating) and against the blitz (133.1 passer rating). Philadelphia’s offensive line should get some props, too, having allowed Foles to be pressured on just 10 of his 43 dropbacks, but Foles effectively out-dueled Tom Brady on the world’s biggest stage, making him a very deserving Super Bowl MVP. Philadelphia capitalizes on Brandon Graham’s strip sack and get three more points on the board, boosting their overall win probability to a near perfect 96 percent. The first sack of the game is a costly one, pushing the Eagles’ win probability from 90 to 94 percent at the two-minute warning. This one wasn’t without drama. Ertz took steps with the football only to look like he didn’t survive the ground. The officials upheld the ruling on the field and the Eagles got the touchdown. Philadelphia would miss the two-point conversion but still give itself a 90 percent win probability. For the first time in the game, the Patriots have a lead. And even though it is just a one-point lead, with 9 minutes and 22 seconds left on the clock, the win probability model is starting to give them almost a near lock to win at 85 percent. This touchdown also puts Brady at the top of the MVP ladder, adding almost 48 percentage points to his team’s win probability over the course of the game. Elliott hits his second field goal of the night, giving the Eagles 32 points, which could be bad news for the Patriots. According to NFL Research, the most points allowed by a winning team in the Super Bowl is 31, which has happened twice: Pittsburgh Steelers over Dallas Cowboys in Super Bowl XIII and Baltimore Ravens over San Francisco 49ers in Super Bowl XLVII. The Patriots marched down the field, capping a seven-play, 75-yard drive with Brady’s second touchdown of the game. He also went over 400 yards on that play, giving him 403 passing yards with about 18 minutes left in the game. His postseason high for passing yards came against the Atlanta Falcons in last year’s Super Bowl, when he threw for 466 yards in the miraculous comeback (including overtime), earning him his fifth championship ring. Nick Foles and Corey Clement survived a reply review, and the Eagles take a 29-19 lead over the Patriots, giving them a 75 percent win probability. Had the catch been overturned, their chances would have dropped to 44 percent. Clement has 101 yards from scrimmage with a touchdown at this point in the game, putting him second in current MVP odds behind only Foles. If it isn’t broke, why fix it? Brady and Gronkowski connected on 4 of 5 passes that drive for 68 yards and a score. Leading up to the Super Bowl, Gronkowski caught 76 of 117 targets from Brady for 1,186 yards and nine touchdowns. Nick Foles has completed 13 of 22 passes for 215 yards with a touchdown and interception in the first half, plus he had a one-yard catch for a touchdown, giving him a total win probability added of 21 percent, the highest among any player in Super Bowl LII — that makes him the front-runner for the Super Bowl MVP award. Eagles running back Corey Clement produced 62 yards on three plays from scrimmage on that 70-drive scoring drive, but it was a trick play that ended up putting the points on the board. Give credit to coach Doug Pederson for going for it on 4th and 1 with 38 seconds left. White scores a touchdown for New England, cutting the Eagles lead to three points after kicker Stephen Gostkowski misses the extra point. Why, then, are the Patriots in the lead in terms of win probability? Remember, they were a 4.5-point favorite to open the game, so this is in essence a tie game with New England considered the better team. The Eagles were rolling, as Jay Ajayi had a 26-yard run to put Philadelphia close to the red zone. But then Foles’ pass directed at Alshon Jeffery is deflected and falls into the arms of Patriots safety Duron Harmon, giving him his fifth interception this year. Gostkowski makes up for his previous miss and gets the Patriots within nine points. Rex Burkhead had the play of the drive, a 46-yard catch from Brady on a screen pass to start things off. Blount found a seam up the middle and went largely untouched into the end zone, his 11th career touchdown in the playoffs. He had a 36-yard gain up the middle behind the left guard earlier in the game. Things are getting interesting in Minnesota. Foles hits Jeffery in the end zone for a big gain and the score, but they miss the extra point. Foles accounted for 41 of the 77 yards on that drive, giving him a lion’s share of the 19 percent win probability added by that score. Gostkowski gets the Patriots their first points in the first quarter of a Super Bowl with Bill Belichick as head coach. Tom Brady completed 4 of 6 passes to three different receivers on that drive for 58 yards but Gostkowski improves New England’s win probability by eight percent for hitting the field goal. The Eagles capped off a 14-play, 67-yard drive with a field goal, improving their win probability from 37 to 45 percent. Eagles quarterback Nick Foles went 6 for 9 for 61 yards, but it was Elliott’s leg that gets the credit, pushing his win-probability added to plus-8 percent, giving him an early leg up in MVP honors. The Patriots are the best team until someone proves they aren’t, prompting the oddsmakers in Las Vegas to install them as a 4.5-point favorite on Super Bowl Sunday. That gives New England an implied win probability of 63 percent before kickoff. Why 63 percent? Because since 2002, the year the NFL expanded to 32 teams, teams favored by 4 to 4.5 points have a 49-25 record in the regular season and a 4-0 record in the playoffs. After adjusting for the small sample size of games, that results in a 63 percent win probability. As the game goes on, the win probability will be updated based on scoring margin and time left in the game. We will be sure to update the live in-game win probability after every significant event of Super Bowl LII. Not only will we know the chance each team has to win the championship game, we will also know which players should be considered for the MVP award based on the plays that swing the win probability the most. Historically, quarterbacks dominate this award, winning 28 times — four times as often as running backs (seven). According to William Hill Race and Sports Book, Brady and Foles should also be considered the favorites to win the MVP award in Super Bowl LII. 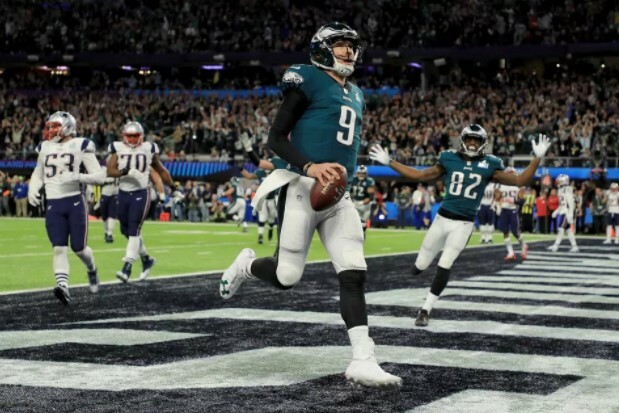 0 Response to "Super Bowl 52: Nick Foles is a deserving MVP after 373-yard, 3-TD performance"